At any point on a transmission line, the peak voltage is given by the simple expression Vpk=(2*P/G)^0.5 where P is the real power and G is the conductance component of admittance at that point. Analysers don’t often directly display admittance (or its conductance component), perhaps a concession to hams who seem to not get their minds around the concept of admittance. Some analysers do display a parallel equivalent circuit using impedance elements, we can work with the equivalent parallel resistance Rp. In that case, the expression becomes Vpk=(2*P*Rp)^0.5. More relevant may be the critical value of G or Rp. G=(2*P)/Vpk^2 and R=Vpk^2/(2*P). I will use Rp in the rest of this example as the AA-600 used displays it directly (even if formatted wrongly). So, for our scenario of 800Vpk maximum at 400W, the critical value Rmax=800^2/(2*400)=800Ω. Above is a scan viewed in R||+jX format as Antscope calls it. This is using the latest version of Antscope at his time, v4.2.63. First thing you will note is that the graph scales which are zoomed fully out are scaled to +/-600Ω, pretty useless for analysing this pretty common scenario. Never mind, if we go back to Antscope v4.2.57 we can display the data more usefully. Above is a scan viewed in R||+jX format as Antscope calls it in v4.2.57. 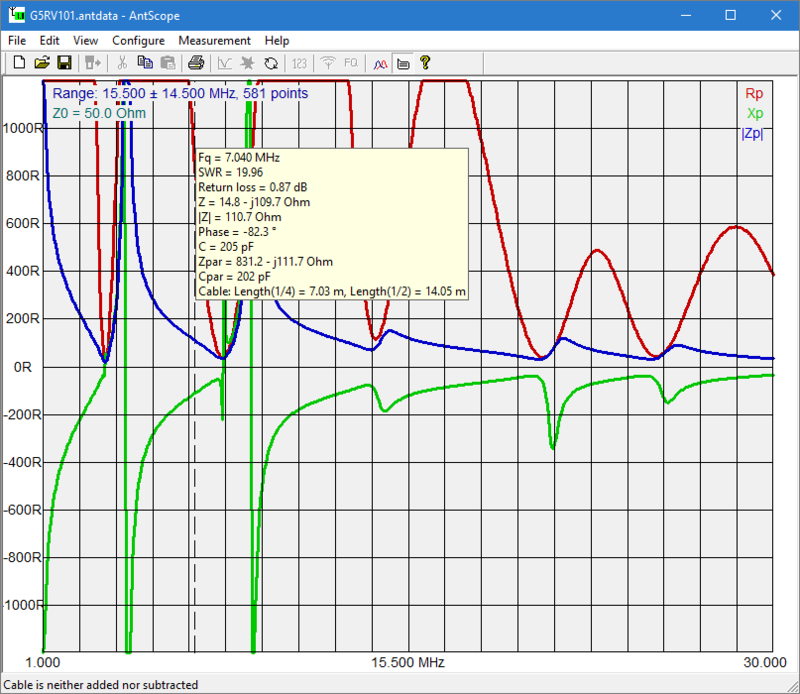 Ignore the blue line, it is for hams who think of impedance in scalar terms. Focus on the red curve Rp. 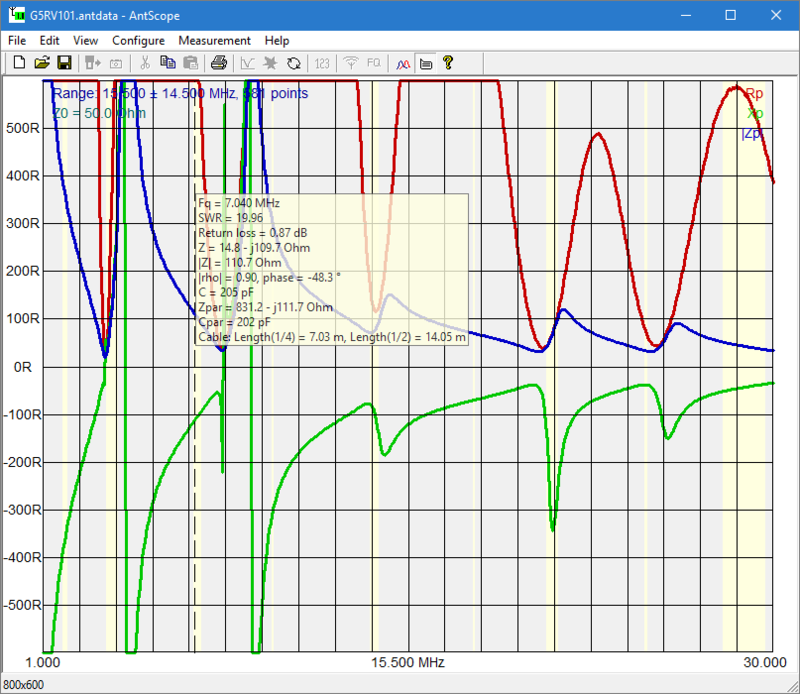 The critical value of Rp is 800Ω, so any frequencies within the intended operating bands were Rp>800Ω flag a problem. Note at the cursor, the cursor data shows Zpar=831.2-j111.7. 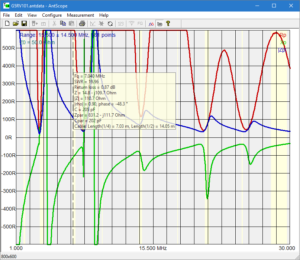 This is a nonsense combination of the parallel components, and is mathematically bogus… but the value 831.2 is the equivalent parallel resistance Rp we have been talking about, and at 7.040MHz it exceeds our critical value. Above is the display from AIM910b of a similar scenario. 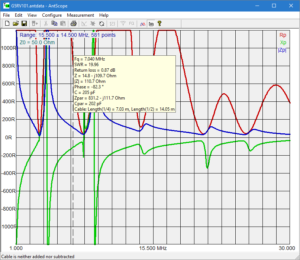 Note that at the cursor (7.020MHZ), Rp=847Ω which is greater than the critical value calculated. This method can be used to determine compliance with a maximum voltage that might be imposed by component limits (eg baluns etc) or perhaps surge arrestors if they are employed. 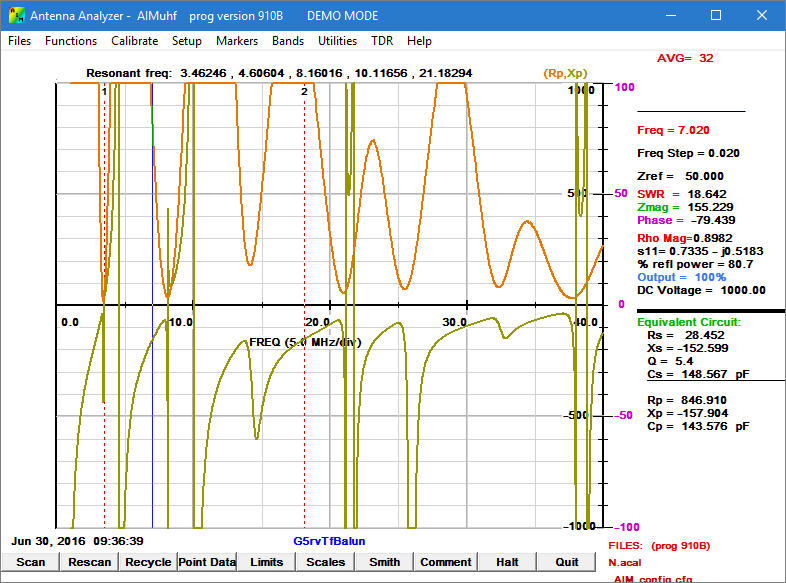 If your instrument does not directly display G or Rp, it can be derived from Z (Rs, Xs), or possibly from some other figures given by some low end analysers (eg VSWR, |Z| and R). 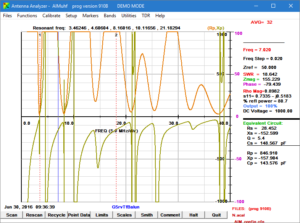 The analyser will need to be capable of measuring high impedance with sufficient accuracy, the example given above would not be possible with the ubiquitous MFJ-259B for instance (or the newer MFJ-269C), though they may be useful for lower critical values of Rp.